Time to introduce a great new development from an SVUnit early adopter: Victor Lyuboslavsky. Victor is a verification engineer at AMD in Austin that started with SVUnit back in February of 2012. He’s been using SVUnit on and off for almost 2 years now. His most recent work: he’s made it possible for people to build and run SVUnit testcases with no tools or library installation whatsoever. More about that in a second. First, an introduction to his browser-based development tool called EDA Playground. 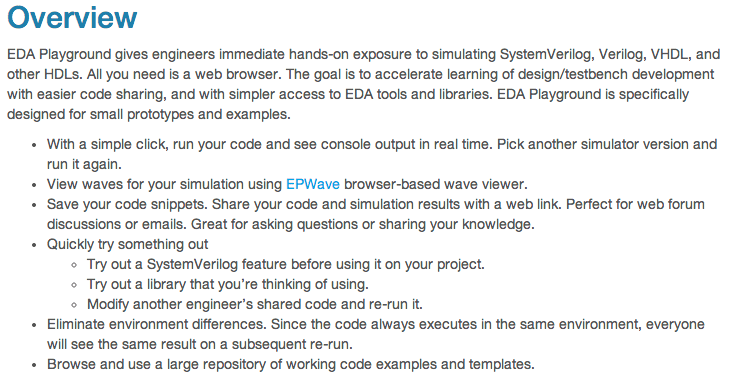 In addition to being able to run simulations in a web browser, EDA Playground offers support for various verification libraries. People can demo small designs built on libraries like UVM, OVM and SVUnit. Yes. Really. To experience SVUnit, all you have to do is go to EDA Playground, load one of the many SVUnit examples, tinker around with the code and hit run! That’s it. No installation, scripting or anything to get started. Just a browser. If you’ve been meaning to try SVUnit but you haven’t been able to find the time, svunitOnSwitch is for you. It’s the perfect little coding exercise you can develop entirely within EDAPlayground. And of course, you can immediately simulate the results to get a feel for the added rigor and productivity you’ll get with SVUnit. The instructions are there; the code is there; all you need is a browser. Just follow the link to svunitOnSwitch. Thanks to Victor for the continued support for SVUnit and putting together a useful tool like EDA Playground.